This is one of most honored posts I've ever ever hosted. Lt. Col. Matthew Fritz is Director, Commander's Action Group of NATO's Air Training Command in Afghanistan. Training a newly formed Afghan Air Force is the epitome in complex continual change management. Matt has become a very dear friend, thanks to Angela Maiers, and fellow blogger at Switch & Shift. I can't put into words my respect, admiration and thankfulness for Matt, his leadership, elegance, eloquence, professionalism and humility. I literally wouldn't be alive if it wasn't for men and women like Matt who fight for, preserve and train others to protect our precious freedom. Please read every word - and hold Matt, his work, our military and their ever sacrificing families in your prayers for safety and strength. Monday started like so many Mondays here in Kabul…wakeup, head through Kabul ice/snow to the Dining Facility to grab breakfast to go, and then trudge over to the office to see what staffing challenges waited in the new day. The routine pleasantries occurred along the way, “Good morning, sir!” and “Nice weather, eh?” The morning prayers of the local population could be heard echoing through the loudspeakers outside the large 25-foot concrete T-walls topped with barbed wire that surround our compound, a Forward Operating Base within an Afghan Air Force base. My feet crunched through the snow propelling my frozen fingers to key-in the cipher code, which opened the cold metal front door of the headquarters building. That is when the greatest surprise was realized. The name scribbled in the “From” section of the label was not one I recognized. The town, “Tehachapi, CA,” was familiar—as it was the town my family and I adopted when we were assigned to Edwards AFB in 2011. “Well played,” I thought to myself…my interest was piqued. Enough examination of the outside of the package—time to figure out what it contained! I drew my standard-issue Gerber‑tool knife from the rig on my body armor and let the pristinely sharp blade slice effortlessly through the tape and label—while being ever so careful to avoid harming whatever wonders lay inside. Then the decisive moment: the unveiling! I could hear the three teammates who shared my tight office come closer behind me, for they too, were anxious to see what lay inside. “You don’t know me, but I work in the church office where your family attends Sunday mass. I saw our Knights of Columbus creating care packages to send your way, and wanted to let you know we are thinking about you. Along with the goodies, there were 25 cards individually sealed in envelopes adorned with the words, “Merry Christmas” and a small label-seal on the flap that said “From the Martin and Sanders Families.” Each card contained personal wishes for good health, happiness and a safe return from children and adults who wanted to tangibly participate in the experience. We soldiers stood there and marveled for a bit at the effort, time and expense involved in getting the box all the way to this particular desk in Kabul in the middle of winter. We smiled, read some notes and then promptly divided the contents among our comrades throughout the building. To be true—one has to respect the true capability of a group of grateful soldiers to field-strip a care package to its basest components and distribute “just the right thing” to “just the right person” who needs it at “just the right time.” It is a remarkable sight, to be sure. 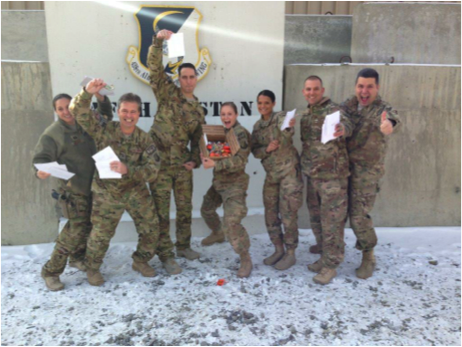 As a soldier deployed for my ninth time since the events of September 11, 2001 I’ve seen firsthand the amazing impact something as simple as a letter can have on the human spirit. Thanks to the efforts of thousands of citizens who contribute time, money and resources to their programs, formal organizations like the USO, Operation Write Home, and Operation Outreach work tirelessly to bring smiles to troops every day. Local organizations like churches, clubs, Scout troops, schools and businesses gather under the leadership of inspired individuals to send love and warm-thoughts of home to local soldiers, sailors and airmen all the time. (A special shout-out to Tehachapi KofC Council 7821 and Cub Scout Pack 3 for being there for me in this regard!) Moreover, in unique instances, someone takes it upon themselves to directly affect the life of someone they know—either personally or tangentially—through a simple act like the one I described above. The common theme between them is a desire to participate and a willingness to share gratitude. Terms like “Thank you for your service!” and “Come home safe and soon!” are like fuel to those who receive them—renewing the spirit to soldier-on and reminding them that completing the mission successfully is a goal worth fighting for. The display of patriotism, pride, support and gratitude from a country where less than 1% of its population participates in the military is telling. There is a level of sincerity and empathy that underlies these expressions of gratitude—even when there may be little understanding of the soldier’s true reasons for joining the military, disagreement with political or national policy, or a lack of agreement as to the reasons for military action in the first place. It’s the human element—the connection and bond people feel when love is expressed and love is received or returned—that makes it appealing and repeatable in warzones throughout the world in battles throughout history. In simplest terms, it is a desire to participate in the act of gratitude that motivates people to act. Truth be told, according to the Pentagon, less than 25% of Americans aged 16 to 24 qualify for admittance to the United States Military. That equates to 26 million young Americans who are unable to participate--mostly due to inadequate education, physical fitness or criminality. As such, 75% of Americans seek the opportunity for service opportunities in other ways. General Martin Dempsey, the current Chairman of the Joint Chiefs of Staff since 2011, shared in a 2013 speech entitled “The Military Needs to Reach Out To Civilians” that members of the military don’t have a “monopoly on service or sacrifice.” He went on to share that, “...[a]cross our country, police officers, fire fighters, teachers, coaches, pastors, scout masters, business people and many others serve their communities every day. Military service makes us different, but the desire to contribute permeates every corner of the United States.” His point—that service is a calling, and gratitude can rightfully be shared with leaders throughout our community. The desire for service is based on a desire for participation. Participation is afforded to each according to the abilities they bring to the table. In the end, it is the expression of gratitude that fuels the fight and keeps the reminder of service – and our connection to servers – in our minds. It can be as involved as raising your right hand to volunteer or as simple as sending a care package. In the end, the result is renewed resolve, unity of effort and strength of heart. Hallmarks of what binds us together in the shared human experience of Gratitude. As I prepare to close this article, let me once again offer my thanks to the Martin and Sanders family, and all individuals and groups who brighten our days with their expressions of gratitude. There can never be enough coffee, treats, toiletries, letters or warm thoughts to overburden our repository for America’s generosity we affectionately call the #GratitudeCafe here in theater. Rest assured that no matter what it is those of us serving harm’s way receive, every heart is touched and every soldier is reminded that someone back home cares for their safe return. We salute and extend our gratitude back to you! Matthew T Fritz is a leader and mentor in the field of complex organizational change, emotional intelligence, and organization strategy. A successful DoD senior-acquisition program manager and test leader, Matt has earned documented success in the areas of test and evaluation, assessment, technology development and flight operations. He has specialized experience in cost, schedule and performance management and is an active duty Field-Grade Officer with command-experience in the United States Air Force. Matt is also a certified acquisition professional, as well as a certified Emotional Intelligence Trainer/Practitioner. He and his wife, Stacy, enjoy life with their daughter and son in California.